Buses to Sucre leave every hour from the Nuevo Bus Terminal up north of Potosi town and costs Bs 30 one way. After inquiring about the buses at my hotel front desk, the lady gave me a better alternative of taking a shared taxi that will cost Bs 40 per person (considering there are 4 people in the taxi). She offered to call the taxi that will directly go to Sucre from the hotel, so I didn’t have to go to the bus station. But after about twenty minutes, she got a call saying they were unable to pick me and I will have to get one myself from the bus station. Upon exiting the taxi to the bus station, I was surrounded with people asking passengers to Sucre, and seeing the first one has two people already in it, I took up the offer, loaded my bag and kept waiting for another 30 minutes for one more passenger. Be prepared to get hoarded by taxi drivers at the Potosi bus station asking for ‘Sucre’. Just say no and take your time going around the taxi stand looking for the ones that have some passengers in it. Remember that the taxi will not leave until all four (or five) passengers are in it. So instead of waiting in the taxi for minutes, perhaps hours, go for the one that is pre-filled with some passengers. And always settle on the rate before agreeing to hire one. Finally, with all passengers on board, we were off to a 2.5 hour smooth ride to Sucre along the mountains on the B5 highway (this is the same highway from Uyuni to Potosi). Note that the taxi doesn’t make a stop in between. The final destination of the taxi in Sucre is the bus terminal, but having downloaded the map before leaving Potosi, I was aware of the streets in the city center and hoped to get down close to the hotel I had booked, rather than going to bus terminal and taking another taxi to the hotel. And luckily for me, the route was almost exactly the way I imagined it to be. So I hopped out at the intersection of Calle Urcullo and Ave Aniceto Arce, from where it was a 50m walk to the Wasi Masi Hostel on Calle Urcullo. Located walking distance from the main square, this is quaint little hostel with very friendly, but non-English speaking staff. 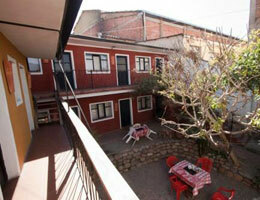 The hostel has a big courtyard with chairs and tables for chit-chat with fellow travelers or dining; and also comes with a small kitchen in the corner. Wifi is available across the hostel. The rooms are big and clean, but the bathroom had a peculiar smell because of which I had to keep the door closed at all times! Good beds, good breakfast, great location and cheap rates makes this a better choice to stay at. It was in the afternoon that I reached the hostel, so I set out to explore Sucre. A 15 minute downhill walk from Calle Urcullo was the main square. One of the first things any new visitor to this town will observe is the “Learn Spanish” boards at every nook and corner. Sucre is a popular town to learn Spanish and Quechua languages, and you have many institutes that offer courses from a few hours for basic language skills to few months long. And they all vary in prices to shop around for the ones with good reputation and price before signing up. 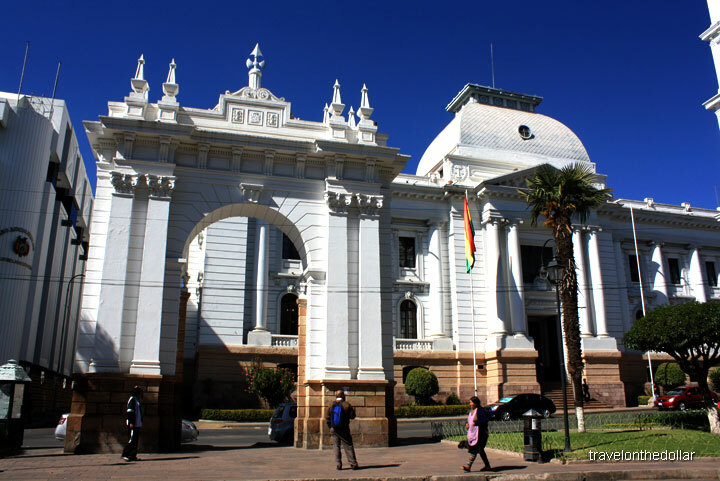 The Instituto Cultural Boliviano Aleman (www.icba-sucre.edu.bo) offers recommended Spanish lessons with homestay options. Another institute is Academia Latinoamericana de Español (www.latinoschools.com) that has a comprehensive program featuring cultural classes and homestay options. Two blocks from the main square was Correo Bolivinaos where I got the stamp in my Postal Stamps Travelogue book, and headed back to the square for a meal at Abis Cafe (free wi-fi). It was late afternoon, which meant time to relax and explore the city. 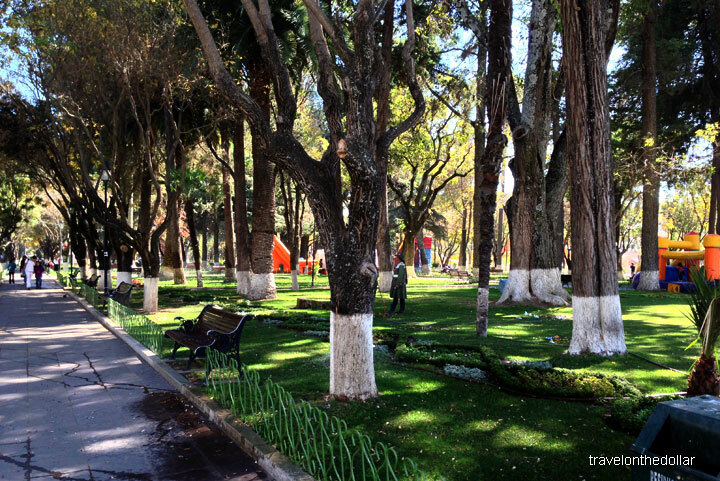 Rather than visiting the sights to see, I walked straight to Parque Bolivar – the huge park in front of Corte Suprema de Justicia and Teatro Cran Mariscal Sucre. 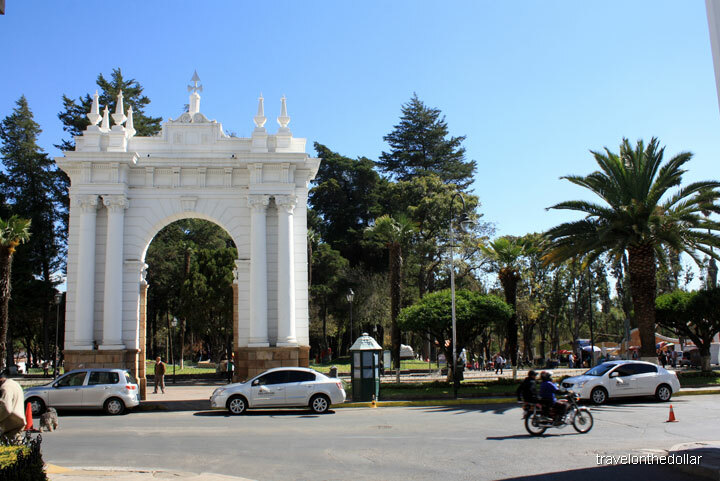 Sandwiched between two avenues flanked by ceibo trees, this park is great for a quiet stroll, and its strongly European style is highlighted by the replica of the Eiffel Tower, built by the same person that built the original one in 1906. The French influence is seen in an archway that looks like the Arc de Triomphe. Lazed around the park for a while watching the locals have a relaxing afternoon with their kids and families. With the sun setting in the hills, I could see the locals heading home from work, and I decided to do just the same. Overall, it was a lazy and relaxing, yet cold, day that ended with some drinks and chat with fellow travelers form France, Germany and Britain, at the hostel.